The first is ‘ARCHE’ – meaning the origin, the beginning. Indeed a large part of our methodology is dedicated to exploring the history and heritage of your organization. Our experience has shown that to devise pertinent strategy with a view to the future, there is a lot one can learn from exploring and understanding the recurrent patterns that make up the history of your organization. This process of patterning will reveal the singularities and strengths that are unique to your organization. The second is ‘STASIS’, commonly defined as “a state of stability in which all forces are equal and opposing, therefore cancelling each other out”. Part of our work involves understanding these tensions – the opposing forces that make up an organization’s Excellence. By understanding the mechanisms behind these forces, you access an important key to replicate this Excellence more broadly and repeatedly across all the activities of your organization. In the last decade, circumstances have driven companies to become so focused on their short-term imperatives, that many organizations lack a clear sense of direction and purpose. Slowly but surely, this is affecting the way in which these organizations are being managed, the integrity of their activities, their ability to compete. We help companies and their leaders reconnect with their essence. With what made them Excellent in the first place, so that this can serve as a basis to elaborate more differentiating, inspiring and competitive long-term strategy. More than ever, organizations are faced with the challenges of a global economic recession, increased competition in every possible sector of activity. Typically, organizations are confronted with a market positioning that lacks pertinence, marketing communication strategies that aren’t delivering, a need for greater brand differentiation, or a workforce that has lost its bearing, unsure of the role it plays within the organization. But more than anything, the biggest challenge facing these organizations is a clear sense of purpose and direction, a long-term vision. The relentless pace of affairs, like the race for performance and profitability is having a significant impact on the stability – and in some cases the long-term viability of countless organizations. Many organizations are mired in an unending cycle of short-term actions and reactions that lead nowhere, except an inevitable deterioration of their assets. Too many organizations are driven by short-term imperatives. Apart from elaborate business or commercial plans, few companies take the time to consider their greater purpose, their ‘raison d’être’, and to elaborate a clearly defined vision worthy of the name. Without this vision, they gradually mitigate the cohesion and coherence so vital to ensure the optimal performance of their activities, which includes the management of their brand or suite of brands. Consequently, these organizations are confronted with a growing disconnection between their inherent strengths and deeper identity, and the lack of a clear and differentiating positioning strategy that builds on these strengths in a unique way. We observe an increasing disconnection between the deeper needs and aspirations of the individuals that make up the driving force of an organization, and the reality of the organization’s day-to-day activities. We note a divorce between the values these organizations say they stand for through their communication and advertising, and the way these organizations are actually perceived, their brands and services experienced by customers. The lack of coherence that characterizes the activities of many organizations, is slowly but surely having an impact on their ability to differentiate and compete effectively, is having an adverse effect on the motivation and involvement of their workforce and is therefore also inextricably affecting the overall profitability of these companies. Like every company, your organization is unique. Your people, your culture, your fundamental expertise… Every Company has a source of Excellence. But this source is rarely fully understood, nor is it leveraged or exploited to its full potential. Our purpose is to help organizations and their leaders reconnect with their Excellence. Our approach and methodology reveals the core, essential strengths that made your organization successful in the first place, so that you can devise more pertinent and coherent strategy for the future. In this day and age, customers don’t acquire a product or service solely for its intrinsic qualities and benefits. In reality they also increasingly look at the values a company or organization stands for, its purpose and broader role in society. In the words of Roy Spence: “The core is not what you sell, it’s what you stand for”. And rightly enough, it’s increasingly clear that the challenge for brand management is finding ways of connecting with customers that provide value, substance, significance and meaning beyond their current product and service definition, and those offered competitively. With the growing commoditization of products and services, the priority for most organizations is to create the conditions for people to make an inspired choice when they consider purchasing a product or service. Our experience demonstrates time after time, that to effectively align the activities of an organization, to help differentiate it and its brand(s) in a competitive market place, and to ensure a stronger and more sustainable positioning over time, it is key to identify what lies at the heart of an organization, its source of Excellence. With the digital revolution, our gradual passage into the ‘Knowledge Society’ and the deeper societal changes that are resulting from this transition, companies and organizations need to adapt at an increasingly rapid and destabilizing pace. With this in mind, many company leaders and senior management mistake strategy for a continuous flow of fresh ideas and disruptive initiatives. They hope these ideas and initiatives will have the potential to steer the course and direction of their organizations in this fast-paced world. Our vision of strategy lies at the exact opposite. Strategy isn’t about change. Strategy is a concept rooted in stability, in set plans and established patterns. “Pay attention to the intricate patterns of your existence that you take for granted”. The knowledge society is around the corner. Economic hardship is putting added strain on enterprise. The digital revolution has created a paradigm shift. Every entrepreneur and leader knows we are at the brink of some fundamental changes in the way we manage businesses, inspire and motivate employees to give the best of themselves, reinvent the concept of marketing and branding to name but a few. As markets become more competitive, and organizations need to redouble in creativity to counter the effects of a global recession, the knee jerk reaction is often to take on fresh ideas and novel strategies. These initiatives and tactical actions can end up leading an organization onto a very different course with the risk of losing its initial heading. The original vision has been diluted, and a clear sense of purpose and direction forgotten or lost. The best way to address these challenges isn’t to look for a strategy of change. It is on the contrary to look within your organization for what is recurrent, stable and hasn’t changed over time. What lies at the heart of your organization actually contains a lot more force, competitive edge and potential for differentiation than one would think. In the course of the last 15 years, we have time on time demonstrated that the answer to an identity crisis, a positioning strategy or a communication challenge to name but a few, is consistently to be found in the recurrent patterns that make up the history and heritage of your company. The Archestasis© methodology has been developed precisely to this effect: to help organizations reinvent themselves, by helping you reconnect with your Excellence. The methodology implies a deep look at some counter intuitive concepts that allow us to comprehend the essential strengths that lie at the heart of your organization. Working on the identity of an organization requires time, energy and a deep commitment. Identity isn’t subject to change. Every organization has an identity. No individual controls this identity. These dynamics are owned by everyone. Yet are owned by no one. Everyone is an expression of the system, and the system is an expression of everyone. Successful individuals align with the identity of the organization. The excellence of your organization is also the limit of its growth. When there is no need for change anymore, we can start the process of change. No one knows it all. No one owns it all. Complexity is source of solutions. A problem that isn’t resolved is a problem that is not yet understood. Find the right question before looking for the answer. The more resistance, the more light. The exchange and combination of perspectives is essential. Together we are on a learning path leading to mutual enrichment. An organization’s identity is reflected in what it does best. That which it truly excels in. Every organization has some form of Excellence. All we do is help you get tuned-in to your Excellence. But what exactly is Excellence? What we know with certitude, is that when an organization – or an individual, are deeply connected to their Excellence, they express their true value in a very natural, simple way. The emergence of Excellence is fundamentally based on the coexistence of complementarities. Two contradictory or potentially conflicting qualities that are perfectly and beautifully combined. For example Discipline and Freedom. It’s the tension, connection and friction between these complementarities that enables an outstanding quality to express itself. The whole concept of our methodology is to unify opposites by identifying the source and expression of complementary qualities. This is the dance between opposites such as Stability and Change. When combined harmoniously, such opposites provide direction, meaning, and power because of their intrinsic energy and intelligence. We are able to change, learn, and grow, because of the creative tension between such opposites. The profound structure of Excellence is, by essence, built on complementarities which are generative. This is why we refer to them as ‘generative complementarities’. This unique approach is what defines the Archestasis© methodology. It is powerful in that it helps establish a framework to guide the elaboration of long-term strategy at all levels of an organization (business, marketing, communication, human resources etc.). With this framework, every important aspect of a company can be managed, planned, aligned and measured by means of a coherent and all encompassing vision. By understanding what makes you unique, the deeper identity of your organization and the organizing principle behind your Excellence, it makes it for example much easier to devise brand and communication strategies that are more in tune with the essence and most essential strengths of your organization. Our approach is systemic. It states, simply, that reality is always a relationship, a connection between distinctive elements that cannot be isolated or separated. In other words, a systemic approach is one that considers elements within a system are by essence, complementary. With this in mind, we can start to see how apparently differing perspectives on any given issue can be looked upon as potentially generating a constructive, generative tension. Highlighting this tension is a powerful tool in understanding the system that gave birth to it. Crystallizing the deeper identity of organizations. Carrying -out a brand development journey. Enhancing differentiation in a highly competitive environment. Tackling a positioning or repositioning challenge. Establishing a disruptive communication strategy. Reconciling two corporate cultures in the context of a merge. Defining a clear purpose or ‘raison d’être’. Establishing a clear vision for an organization. Up-dating an existing leadership model. At the heart of the Archestasis© methodology lies a proprietary model. 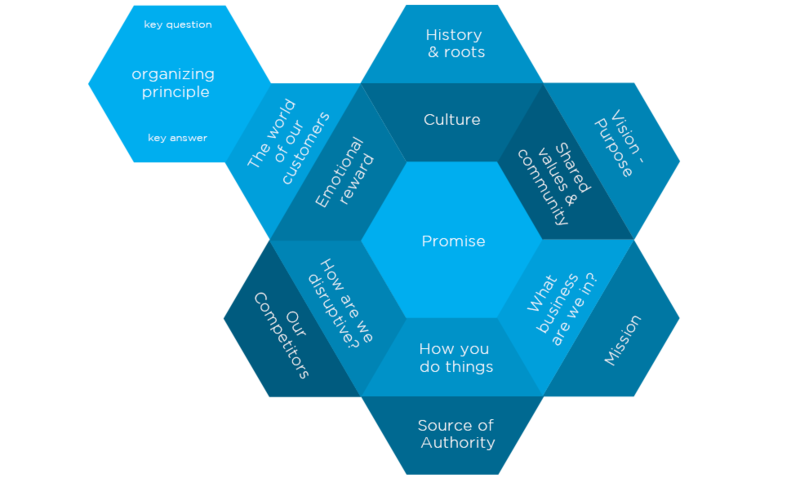 This model can be seen as a blue print that brings together and crystallizes what we have identified as the twelve essential facets or components that play a crucial role in shaping the Excellence of your organization. By modeling and establishing the deeper links between each of these facets, we gradually reveal the essence of your organization’s identity, it’s singularity, core strengths and the source of its Excellence. As an organization embarks on a quest to uncover its Excellence, each dimension of the model is explored at length through a process of questioning and exercises that have been meticulously elaborated, tested and refined over time. In the first step, the questioning process facilitates the uncovering of pertinent insights. But the beauty and magic of the model resides in the second step of the process. Indeed the unique characteristic of the Archestasis© model, is that its twelve constituent elements have been methodically organized and lined-up in a mirroring logic. It is this unique structure that facilitates the patterning process, helps to establish the links between the different components, and unveils how different insights relate to one another, so that the source of your Excellence is gradually revealed. North to South, the segments facilitate the exploration of the History and Roots of an organization, it’s culture (which includes stories, rituals etc.) how the organization does things and its Source of Authority. North-West to South-East, we question the business we are in, which is reflected in the Mission the organization sets for itself. This in turn is mirrored against the deeper motivations of Customers or stakeholders you engage with, and the emotional reward they expect or aspire to. South-West to North-East, we explore the competitive field and opportunities to create disruption in a given sector, and articulate this back to your Organization’s vision, and the shared values and community you seek to establish. Both our methodology and model are linked to our proprietary and original database that allows our clients to follow progress as a mission unfolds, and to add insights and information along the way by accessing any section of the model at random. It also allows us to access the information you have input into the model, and use this source as a basis for later analysis and interpretation. Exploring the model below will provide you an insight into each of its constituent elements, you will find a detailed description of each constituent element of the model. A specially calibrated questionnaire serves as a guideline to input information into each dimension of the model, and can be accessed on the database itself. This section gives you an opportunity to explore the process we go through in our extended workshops, to uncover and reveal the crucial facets that make up your organizational Excellence. In this section, we explore the history of your organization in considerable detail. The more we understand the patterns that formed all along the different stages of development of your organization, the more we can learn from this to actively leverage these patterns in the future. The roots of an organization are rich in insights and lessons that are often taken for granted, at times overlooked or forgotten, and sometimes even occulted without realizing their true value and potential. Every organization has its culture. Organizational cultures have important effects on the morale and motivation of organizational members. We are particularly interested in the ‘symbols’ of culture in the physical and social work environment, which are commonly referred to as artifacts. Artifacts are the most visible and accessible level of culture. They include stories, rituals, ceremonies and rites as well as symbols. This section explores the methods by which a company operates. The way you design a new product, the way you service a customer, the precision or attention that goes into a particular process are all rich in insights, and invariably reveal the first links and patterns in this section of the model. Indeed, how you do things is more often than not a reflection of your History and Roots, of your Culture, and should tie back neatly to the Source of Authority. In this section, the idea is to pinpoint the specific elements that give your organization the kudos and credibility to be an authority in your area of activity. On one hand, this is about identifying the technical skill that lies behind your products or services. But on a deeper level, we are also interested in understanding what lies at the heart of what you do, the inner strength that day-in day-out ensures the credibility of your company and brand(s). If you’re a Telecom operator, you’re undoubtedly in the Telecom business. But that’s not a very powerful point of differentiation, and does not necessarily reflect the deeper culture of your organization. For example, you could be a much smaller player – a challenger with a very strong service culture. Maybe this culture is so ingrained in your organization, that it has effectively become the heart of your business. To answer this question, it’s important to understand what really drives your business, to see the bigger picture, to have a worldview. In what way could this Telecom operator be offering a different kind of Telecom? Knowing what business you’re in clarifies how you’re going to serve the customers you want, and becomes the litmus test for everything your company does. NB: the Worldview of a furniture brand could be: “cool design isn’t just for rich people”. A mission statement is a formal short written statement of the purpose of a company or organization. The mission statement should guide the actions of the organization, spell out its overall goal, provide a sense of direction, and guide decision-making. It provides “the framework or context within which the company’s strategies are formulated. A purpose statement answers – WHY do we exist? Purpose is bigger and deeper than any business goal. When an organization has a clear purpose, it attracts talented personnel, strategic alliances, and loyal customers. Time after time, we have demonstrated that the Purpose statement is the one that creates the deepest emotional connection with your customers. This section requires deeper insights into the needs and motivations of your customers. These can be gathered through a variety of means such as qualitative motivational diagnostics. It is important to go well beyond a traditional socio-demographic description of your customers. What we require here is an understanding of their deeper motivations, their values and the unique relationship that links your customers to your brand(s) and the values and purpose of your organization. It usually is rather straightforward to establish the functional benefits of a product or service. But translating this into an emotional benefit can prove more subtle and intricate. It is however an essential stage to link back to the greater Purpose of an organization, and the community /communities one wishes to establish. A vision statement is an articulation of a view of the world that your company and your people are working towards, not what they are expected to do now, and how specifically, your company will work to achieve it. The vision expresses the philosophy driving the organization. It involves seeing the optimal future for the business, and vividly describing this vision. It is a long-term goal that helps unite the internal team to a common path. It is a clear sense of destination. It isn’t a wish-it’s a definition of the way the world will be in 3 to 5 years and where you’ll fit into it. NB: establishing one’s Vision is a process of discovery, not invention. It comes from the past. It’s born out of the organization’s history and roots. Values are a deeper level of culture that reflects underlying beliefs. An espoused value is what organizational members say they value, like ethical practice. Enacted values are values reflected in the way individuals actually behave, and may differ from espoused values. In this particular phase of the methodology, we are not just seeking to identify the unique values that give an organization its competitive strength. We are more specifically looking for the shared values that attract customers to your brand and /or organization, beyond what you offer in terms of products and services. This is about comprehending the belief system you explicitly or implicitly share with your core customers, and in so doing to assess the nature of the community that is formed. Every market is governed by conventions that have been adopted over time by a majority of the market actors. The purpose of this section is to identify the commonly held beliefs and conventions that typically maintain a form of status quo, and to put them into question. By challenging mainstream assumptions, we make it easier to look at things from a completely different perspective. In fact, departure from a convention forces us to think of another solution, a fresh idea, which in turn forces a positive assessment of a company’s offering. The whole objective is to identify unusual and inspiring ideas that tie back to what makes your organization unique, and on this basis to create a unique brand experience that will move the brand faster towards its vision. A strategy can’t be pertinent or complete, without a thorough understanding of the key actors of a sector. How do these players position themselves, how are they perceived, what and how do they communicate, what motivations attract specific target profiles to the different market actors? These are all questions that are addressed in this section, to ensure the work that is carried out positions your organization and its brand(s) distinctively from other players in the market. Timelessly captures the ‘one thing’ you are offering to your target beyond the product or service. It is the crystallization of your excellence, and conveys how your excellence is translated into something meaningful to your customers. The promise drives the value proposition and provides differentiation that can last. In time, it will become the internal mantra for your employees. What is the question we need to ask that provokes curiosity and a desire to understand what lies central to your organization? What is the question we need to answer to complete this assignment? Every organization has some form of Excellence. The problem is that there often is either an over or under-valuation of one’s Excellence. Our fascination and motivation, is to help you get tuned into your unquestionable Excellence, so that you may maximize your resources, and run your business at its peak potential. We are always focused on the quality of the process to arrive at the most qualitative result. When we pattern Excellence, we seek to understand what is connecting. Patterning is bringing structure in the magic of your organization and expertise. We like to say that we’re on a quest to reveal the choreography of this expertise, of your system. We seek to understand how you can connect with these fundamental dynamics, so that you may leverage them to arrive where you want to be. It involves a deeper understanding of the recurrent patterns that have been at the heart of what made your company successful in the first place. Understanding what is recurrent, stable and hasn’t changed over time, is actually the key to comprehending where the Excellence of your organization truly lies. This process is inspired by a genuine curiosity, a fascination to understand how an organization or person actually functions. This is about comprehending as much as possible about the profound structure of your organization and its expertise. As such, patterning doesn’t reproduce what is visible; patterning reveals what isn’t directly visible. Paradoxes are contradictory yet interrelated elements (dualities), which exist simultaneously and persist over time. By identifying these opposing forces, and harnessing the constant tension between them, you unlock the key for a system – your organization, to continuously improve, and enable Excellence to emerge. Leading a business in these challenging times requires the ability to deal with multiple paradoxes – that is, things that appear to be contradictory but in fact are not. A myth that pervades in many organizations is that discipline and structure are incompatible with creativity and innovation. The more discipline and order you maintain, the less you control your company’s destiny. Entrepreneurial companies begin lean and mean. Their agility allows them to alter course overnight to adapt to changing customer needs. As these companies achieve some measure of success and start growing and compartmentalizing, they may become more organized and orderly, but they are no longer fleet of foot. Excellence in fact is about acknowledging and embracing these opposite forces, and allowing these tensions to combine harmoniously. Revealing Paradox is one of the most powerful features of the Archestasis© model and methodology, and ties back to our chapter on the patterning of Excellence. One of the secrets to success in leadership and business, is how any organization handles what is seemingly contradictory. These contradictions abound in business. It takes a special capacity to stay in the tension of a dilemma or a paradox. From our perspective, resolving these tensions requires not so much common sense as uncommon sense – the knowledge that apparently contradictory demands can still be met. This is precisely where our methodology has proven to be a great asset to organizations and their executives across Europe. Paradoxes are not only normal and inherent to organizations, but if harnessed, can be beneficial and powerful. As globalization, innovation, hyper-competition and social demands create more dynamic and intricate environments, paradox becomes a unique strategic lens to understand and to lead contemporary organizations. We’ve realized that the greatest need of organizations today, is strategic insight and counsel. Particularly when this advice looks at the needs of an enterprise in a holistic way. Our strength as a collective of strategists is that we can call on the wisdom and expertise of fellow strategists in complementary fields to help us address your particular challenge in an integrated, holistic way. This is why we regularly call upon digital and business strategists, artists, design or conceptual talent to work seamlessly alongside us. With the multitude of challenges organizations are confronted to, our approach ensures a coherent framework is set up that facilitates the elaboration of strategy at all levels of your organization. With this integrated approach, the leaders and organizations we serve are able to shift their strategic perspective from short-term initiatives and tactics, to long-term strategies that make the most of the Excellence that lies at the heart of their organization. In increasingly competitive market environments, it is imperative to differentiate your organization and brand from other market players. However, a disruptive or differentiating strategy only makes sense if it reflects what your organization truly stands for, your values and deeper purpose. Most marketing communication doesn’t help organizations to differentiate themselves, let alone to create a unique brand experience. That’s because communication platforms and materials rarely dig deep enough to leverage the true identity of their organization. In this day and age where customers and stakeholders are increasingly sensitive to the values and corporate stance of the companies they buy products and services from, it is key to ensure the identity of an organization – and the communication that takes inspiration from it, are fully aligned with your deeper organizational identity. This is why our methodology is aimed at exploring and uncovering your uniqueness. Only then can we design a meaningful visual expression of it. The Archestasis methodology is in fact an ideal process to translate and delineate the deeper facets of your identity: the values you stand for, your personality, specific character traits, tone-of-voice, etc. These are then transposed into comprehensive guidelines that define all aspects of your identity. We crystallize such work in what we coin an ‘Identity Manifest’. Such a Manifest encapsulates the brand’s look and feel in its entirety, and serves as an invaluable reference document and source of inspiration for the elaboration of coherent and fully integrated communication, both for your internal and outward facing communication. It clarifies how marketing communication elements need to work together. It makes it much easier to draft and support messages that are resonant, more engaging and meaningful to your target audiences. The brand identity and strategy elaborated as a result of the Archestasis© methodology, provides an ideal basis to develop a communication platform for your brand(s). This platform will not only be an expression of your Excellence, it will also provide differentiation that can last. To bring your strategy to life and enhance the capacity of your brand to stand out and differentiate itself, we provide guidelines to accurately reflect the values and purpose of your organization within the conceptual work. This is what is referred to as “reflective branding”. The resulting communication will not only convey a branding message to external audiences, but will also have an encoded message about your deeper culture that will greatly serve your internal communication. Hence our role as strategists is also to reflect the unique values, your Purpose and the source of your Excellence within the conceptual work that takes place once your strategy has been firmly set. By ensuring that your communication platform is beautifully aligned with who you really are, the essential things you stand for, it strikes a more authentic chord both inside the company and amongst your customers or stakeholders, and establishes a much stronger basis for differentiation that will last over time. This allows us to celebrate the culture and values of your brand, and means your communication will not only play a key role in motivating and building pride among your employees, but also ensures other audiences can be inspired by the broader Purpose behind your brand. All-in-all the Archestasis© methodology provides clarity on how to accurately communicate your fundamental difference and source of Excellence. Through our very specific methodology, we are able to explore and elicit the founding values, beliefs and presuppositions of an organization. These elements representing the DNA of a company need to be the building blocks for a leadership model within the organization. What kind of leadership do we want to have in our company? What are the values and beliefs about leadership we want to express? What are the key competencies on the different levels of leadership within the company? Which are the criteria to recognize and select the future leaders in the company? All these questions and their answers will guide us to help the company in becoming explicit about their desired leadership model. A leadership model is like a lighthouse: stable, delightful, inspirational and a reference for a safe direction and journey. As a rule of thumb, every mission we tackle starts with a period of deep questioning and confusion. We welcome this confusion. For out of the turbulence and disorientation, we can start to gather pertinent insights. To comprehend how an apparent incoherence, is actually an expression of a deeper coherence. To understand how an apparent weakness can also be the expression of a real force. To grasp the subtle ties that link one particular event of the history of your company to another. Whether you are a young start-up, or a respected company with a substantial heritage, companies and their organizations are complex entities and cultures that need to be understood in detail for the process to be effective. If your organization is in a hurry because your business can’t wait, and you expect tangible results within an afternoon’s worth of work, this process isn’t for you. And we are unlikely to be the partner you are looking for. Each component of the ArchestasisÓ model is associated to a battery of carefully calibrated questions and exercises, which are carried out in a sequential process so as to gradually fill-in the model. The process is akin to pealing the different layers of a union to gradually reveal the core. This journey will take us from gathering insights relative to the anecdotes that dot your history, to understanding the details and processes that regiment your activities. From grasping your inherent strengths and weaknesses, to understanding the intricacies and complexities that lie at the heart of your organization. This phase of intense questioning is what provides us the insights and material we need to prepare one or more workshops, depending on your needs and specific requirements. Once these essential questions have been asked, a number of links and preliminary patterns will start to emerge. This is the ideal moment to bring together the management and key representatives of your organization to build consensus and crystallize the thinking in a workshop that usually lasts a full two days. To facilitate this process, the ArchestasisÓ model is used as a framework to guide and consolidate the thinking. The beauty of our model is that it not only helps to reveal and bring a certain logic to what lies at your core, but it is also a powerful consensus building tool that helps streamline and crystallize the thinking of all those involved in the process. Our role is solely to moderate the session(s) and to act as catalysts. Carrying out these sessions will prove essential in terms of establishing the ‘red thread’ that will tie the future strategy of your organization and brand together in a cohesive way. The observations and insights gathered during the sessions and workshops of the ‘Extraction’ phase are interpreted and translated into a strategic proposal, presenting a clear perspective on the deeper identity and Excellence of your organization, and preliminary recommendations on how this could be translated into a coherent strategy in function of your requirements: defining your greater purpose, establishing a new leadership model, the positioning of a brand, your brand identity, or elaborating a communication strategy to name but a few. This effectively is the leapfrogging stage, where we translate the results of the ArchestasisÓ methodology into tangible actions, communication initiatives and/or materials that serve to percolate the strategy internally as a first stage, and communicate the strategy externally in a second stage in function of your specific needs. The translation process can address a variety of organizational requirements. Such as establishing an up-dated leadership model, or revisiting and reformulating your mission and vision statements. We also translate your organizational Excellence into a clear promise that is both meaningful and differentiating in your sector of activity. Or we can help translate your Excellence into a communication platform that becomes directly applicable to your brand. One area we are particularly adept at, is translating the strategy into a distinctive visual and graphic identity that fully reflects your deeper truth, values and culture. We refer to this as a Brand Manifest or Brand Book which doesn’t only serve to help understand the brand, but also to guide and inspire your future marketing and communication activities in a coherent and compelling fashion. You can see this Book as the physical manifestation of the living, breathing concept of your organization and /or brand. Once the strategy is set in stone, the next important stage is to define how to execute the strategy over the long term. Concretely, that means devising a clear plan of action and /or communication plan for the coming years. For example, it can cover a specific plan to ensure your employees are more closely aligned with your organizational Excellence, your longer-term vision and mission. Or to define a plan to ensure your customers and prospects have both a unique and consistent experience with your organization and brand. This can also be an opportunity to design a coherent brand ecosystem. Or a cost-efficient multi-channel communication plan that fully leverages your communication platform so as to provide the highest return on the investments you make. This phase also typically includes a rethink of how to build your brand’s web presence and digital ecosystem in the most efficient way. It will help guide your digital strategy and build its eco-system with the tools, content, architecture and functionalities that will best serve future users. Carrying out the Archestasis© methodology is a deep dive into your organization’s Excellence. Ultimately, the model establishes the framework that leads to clear and single-minded strategy that guides all future decision-making. When the results of the Archestasis© methodology are leveraged across an organization, the shared understanding of the organization’s Excellence and capability becomes a driving force for every individual of the organization, and the elaboration of marketing and communication activities in particular becomes much clearer and self-aligning. But the model also accommodates and creates coherence for all other tools and processes that are instrumental to the success of an organization, and leads to optimal leadership of performance. This process of aligning all stakeholders within a clear, single minded coherence of purpose, is the key to strong differentiation, to establishing a unique positioning within a market, and to leveraging ones organizational assets to the full, thereby making it easier to better manage the unpredictability of market forces in an increasingly competitive and volatile environment. This in turn ensures deeper involvement in the activities of the organization at every level of the workforce, greater efficiency, improved synergies, higher levels of integration, and ultimately a higher return on investments. Identify the excellence of your company. Develop a new updated leadership model. Revisit and reformulate your mission, vision and promise. Make sense of the organizing principle that can guide all your strategic imperatives. Inspire and align branding, marketing and communication with your deeper values and identity. Establishes deeper and more meaningful experiences with your organization/brand. Deepen the brand and the acknowledgement of your brand in the market. Bring coherence to your internal and external communication. Crystallize your identity in an identity manifest. Wisdom comes from sitting around a table, talking about differences without having to change them. Archestasis represents the creative synthesis of the work of two experts in their respective fields. Jasper Donker van Heel has accumulated his experience over a 25-year period as an identity and brand strategist. Jan Ardui has built up his career and expertise as an International Executive Coach, specialized in modeling excellence in individuals, teams and organizations. Other members are joining our close-knit collective of strategists, committed to this very unique and powerful methodology. Douglas Geddes is one of these, and brings his 20-year experience of building strong, meaningful brands. Archestasis© is not just a methodology. Before all, we are a partnership, a collective of strategists with rather unique and uncommon profiles. What makes us singular is the way in which we integrate and combine both our individual talents and distinctive strategic disciplines. This unique combination of skills enables us to address the business challenges and strategic needs of the companies we serve in an all-encompassing holistic way, by means of our proprietary methodology and approach that has been tried and tested for over a decade. There is nothing quite like our collective anywhere in Europe, or further abroad. Our philosophy and approach are always based on curiosity and dictated by non-judgment. Our role is not to change your organization. It is on the contrary to accompany you in order to shed a different light on the strengths that are inherent to your organization, and to provide the keys to reveal and leverage your Excellence. Like our methodology, we are also a source of paradox: we combine freedom and discipline, performance and alignment. We combine imagination and a rooted sense of reality. We are humble and proud at the same time. But more than all, we are passionate about our work. Our team is principally based in Belgium, but active on an international basis. The model and methodology have been applied to a large array of highly respected national and international organizations and brands. References can be given upon demand.